Alexander, William. The monarchicke tragedies. London: Valentine Simmes [& George Eld] for Edward Blount (1607). STC 344. Alexander, William. A paraenesis to the Prince. London: Richard Field for Edward Blount (1604). STC 346. Alexander, William. Aurora. London: Richard Field for Edward Blount (1604). STC 337. * These are the two preliminary leaves of The Alexandrean tragedie, misbound at the front of the volume. ** In both 1604 and 1607, these usually appear before a2. In 1604, A3 was preceded by A2, the general title, and a blank (present in the Beinecke copy). In the 1607 issue, the title page to The Monarchic Tragedies is a single-leaf insert (π1 here), canceling the 1604 title page. 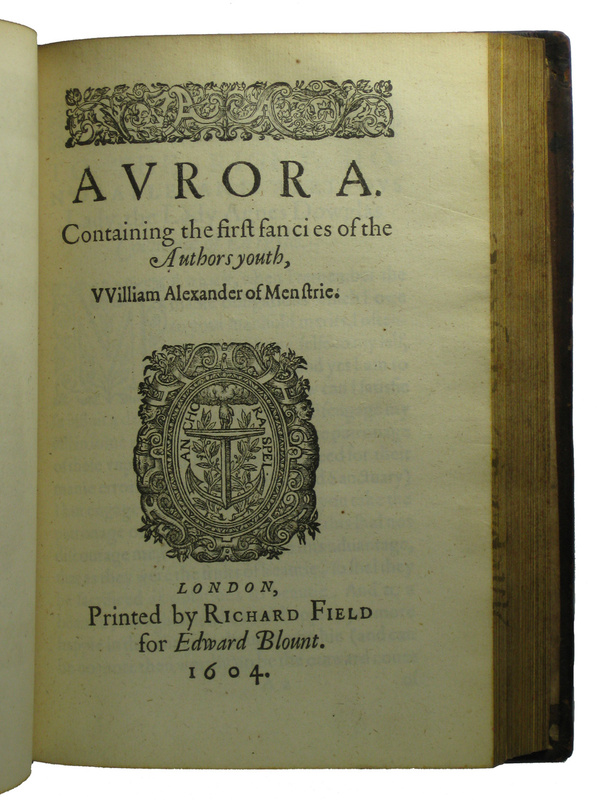 More than fifteen years before he helped finance Shakespeare’s First Folio, Edward Blount published a collection of plays by the Scottish politician and writer William Alexander. When issued in 1604 and when augmented in 1607, The Monarchic Tragedies was one of the only collections of English plays available in print. In fact, a good case can be made that it was the first, though Blount apparently designed it as one part of a larger collection of literature. On 30 April 1604, he registered “The Woorkes of William Alexander of Menstrie” with London’s Company of Stationers. Along with The Monarchic Tragedies, the “Woorkes” were to include some non-dramatic poetry: “Paranethis to the Prince. and Aurora.” There is no evidence that a title page for the collection was ever printed, but volumes like this one indicate that Blount did market The Monarchic Tragedies, A Paraenesis to the Prince, and Aurora as a set—to some customers, at least. 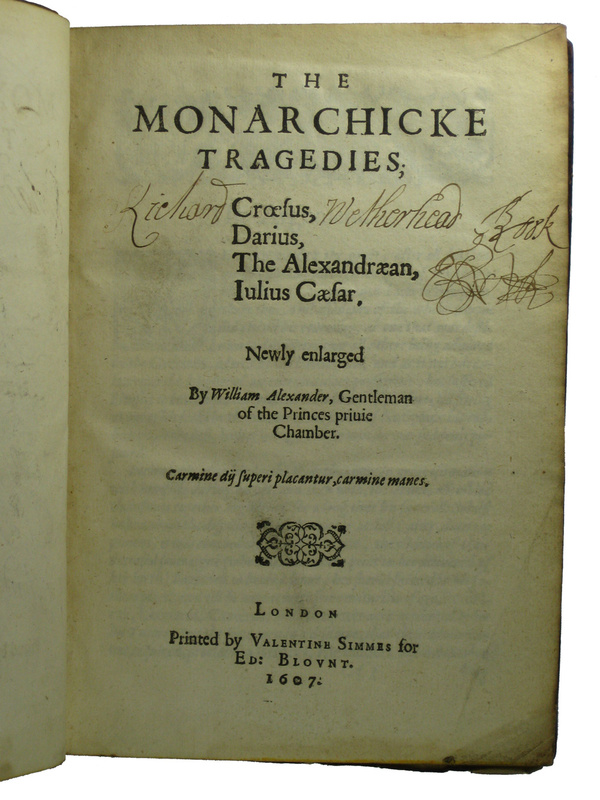 The first issue of The Monarchic Tragedies, which came out with the poetry in 1604, contained two plays: The Tragedy of Croseus and The Tragedy of Darius. In 1607, Blount reissued The Monarchic Tragedies with two more plays written by Alexander: The Alexandrean Tragedy and The Tragedy of Julius Caesar. 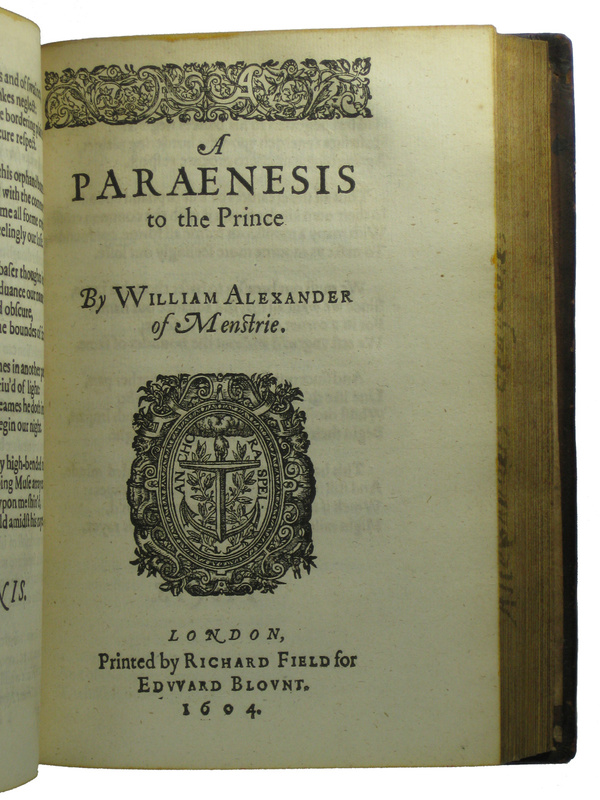 The present volume preserves the 1607 issue of The Monarchic Tragedies and both of the 1604 poetry editions, A Paraenesis to the Prince and Aurora. In this copy, A Paraenesis to the Prince and Aurora follow Croseus and Darius. The Alexandrean Tragedy and Julius Caesar then come after. 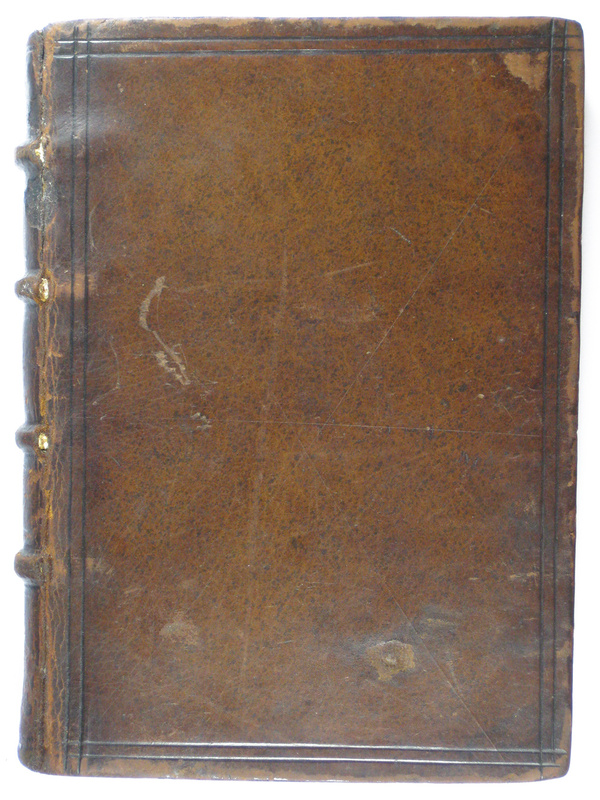 Because the 1607 plays follow the complete 1604 “Woorkes,” they were probably added to the earlier material, which had previously been in its own binding. (More on this below.) In other copies I have located, Paraenesis and Aurora follow all four plays. As noted in the collation, the two preliminary leaves of The Alexandrean Tragedy have been misbound at the very front of this volume, immediately after the general title page of The Monarchic Tragedies. Paraenesis and Aurora both collate complete, including the final blanks. The Monarchic Tragedies lacks the divisional title page for The Alexandrean Tragedy, the blank that may have preceded it, and the blank that should precede the general title page. The blank at K4, the end of Darius, is present. Of the copies I have been able to check, only one at the Beinecke preserves the blank preceding the general title page, and none retain a blank, A1, before The Alexandrean Tragedy. The pages throughout the book are remarkably clean and bright. The volume remains bound in seventeenth-century sprinkled calf; it has not been rebacked or otherwise conserved. The covers are decorated only with a frame of blind double fillets near the board edges, and the fillets cross to form small Oxford corners. The spine has four raised bands with pairs of blind lines at the top and bottom of each of the five compartments. All of this is very typical of English trade bindings from the period. 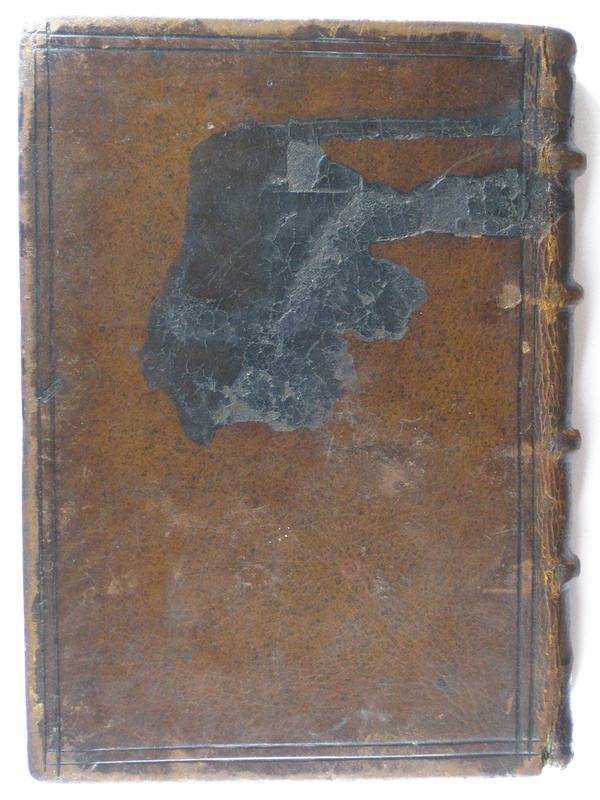 There is some scuffing and one larger (~1cm) gouge out of the leather on the front cover, and the rear cover looks to have sustained a rather serious ink spill, causing discoloration and damage to a significant section of the leather (~8cm x 9cm). Though unfortunate, the damage does attest to the early modern recommendation that readers be able to write in the presence of their books. All three board edges are decorated with a gilt diamond pattern, which, unlike the austere covers and spine, would have been visible when the book was shelved with the fore edge facing out. The text block would also have been visible; all of its edges are colored yellow with red sprinkling. Dust over the centuries has darkened it, but this edge decoration was once quite vivid. The foot edge is brighter than the others, and some pages preserve the original yellow where it has encroached into the margins. A seventeenth-century owner has written “Allexanders tragedies” on the fore edge, further enabling potential readers identify the book on a shelf. Both hinges are rubbed and the front one has cracked through, but the tawed supports remain intact and secure both covers well. The binding includes plain paper pastedowns and a free endleaf at front and rear. The first black-letter quarto of the King James Bible (1613, STC 2227) makes an appearance here, too: waste from the Book of Ezekiel is used for endpaper guards. This helpfully indicates a terminus post quem of 1613 for the binding. Everything about the style also fits with an early- to mid-seventeenth-century date. Notably, however, a témoin (a folded “witness”) on H4 of The Alexandrean Tragedy all but guarantees that the book—or part of it—was previously bound: the extended edge is also trimmed. That said, there is significant ink transfer from the 1607 Monarchic Tragedies title page onto the front free endpaper, indicating that the two leaves have been in contact for a long time. This, of course, is confirmed by the early date of the binding itself. The témoin may suggest that the current binding is the second binding for the whole collection, and perhaps a third binding for the 1604 sequence. Because the current binding dates from no more than a few decades after 1607, this would be surprising, but it is by no means impossible. Bindings can damage easily, and well-to-do owners would have had no problem financing repairs. An alternative possibility is that the 1607 material was taken from a separate bound collection, and that the témoin only tells us about its early binding, not the history of all the volume’s printed material. If true, the current binding would be the second for both parts. The idea would be that the 1604 material and the 1607 material had been in separate bindings, and were newly joined when the present book was made. The more basic claim that this is not the first binding for the 1604 material is supported by the fact that A3 and A4 of The Monarchic Tragedies, which would have followed the original 1604 title page, are soiled in a way that surrounding leaves are not. Light staining on the margins of both of these leaves and the final leaf of Aurora probably place them at the extremities of an earlier bound volume. Unfortunately, because the binding is tight and so well preserved, the underlying structure cannot be examined without special imaging. X-ray or CT would likely help to clarify the early history of this book. There are some annotations at the very front of the book. 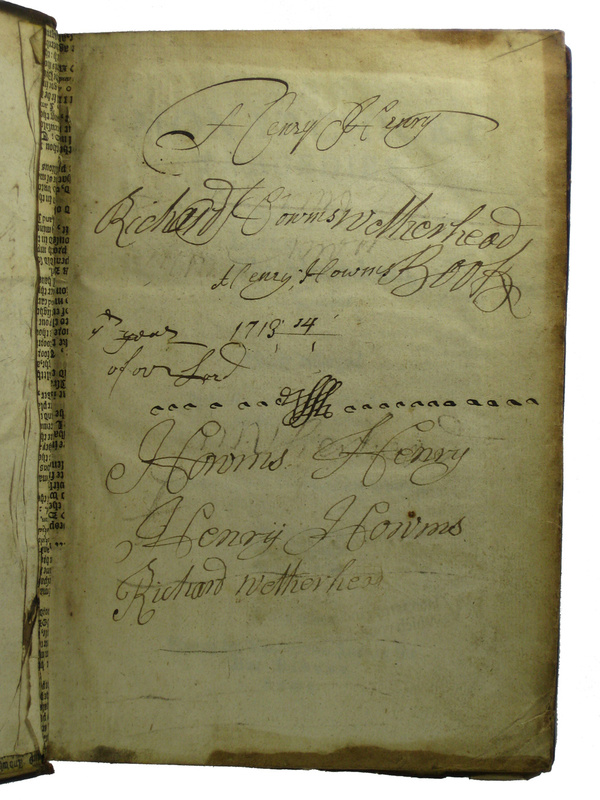 Two names have been written multiple times on the recto of the front free endpaper, giving us some sense of the book’s life in the eighteenth century: “Henry Howms” and “Richard Wetherhead.” The date “1713 14” appears in the middle of the leaf, and is perhaps attached to one of the Henry Howms inscriptions. Richard Wetherhead has also written his name and initials on the title page. All of the handwriting on the endpaper and title page is consistent with an eighteenth-century date, and there are no other marks in the volume. This website and its content are licensed under a Creative Commons Attribution-NonCommercial 4.0 International license.